Whether you are out into the wild for bush crafting or in for a combat, having a good knife in your possession will give you the best of both worlds. It is needless to mention how important a knife is if you are out in the wilderness; from slicing wood to cutting fruits, from making a fire to cracking open nuts, this fixed blade knife can be used for a variety of purposes. Not only is the ESEE 6P great for batoning, splitting, chopping and cutting, with a bit of customization, it can be lethal in case of combat situations as well. The knife consists of a pitch black blade with a grey handle, and comes with a beautiful desert brown sheath, complementing the knife perfectly. Let us now look into the details of the special characteristics of this knife that makes it stand out in the market. The overall 11.75inch knife includes a 6.50inch blade (made of high carbon steel) and weighs 12 ounces. The thickness on the blade is 0.188 inch. Moreover, it is a full tang knife which assures its strength and ability to withstand high pressures without the blade falling off. The ESEE 6P is great with chopping because of its blade length; the choil just beside the handle helps to carve out wood with great precision which can then be used for a campfire; it can be used for batoning to cut a tree into pieces. All of these can be done effortlessly because of the design and dimensions of the blade. You can also use this for combat situations because of the strong, sharp edge on the tip of the blade. The ESEE 6P boasts a beautiful Micarta handle on top of its full-tang blade. Known for its strength, durability and it’s resistance against extreme temperatures and moisture, the Micarta handle forms the perfect combination with the high carbon steel blade. The design on the blade is perfect for your hand to rest on, and assures that your palms do not slip while doing heavy duty work. You can also put your small finger into the little loop of nylon at the end of the handle for better protection. The overall design allows you to cut through the most rigid materials without leaving a single scratch on your hands. As it can bear extreme temperatures, you can use it in the freezing conditions as well as in the most humid ones, without fear of it getting brittle in the long run. The sheath is made of molded polymer; although cannot be compared to a Kydex sheath, it is still one of the most top quality sheaths in the market for plastic sheaths. It comes with a drain hole to let out the water preventing the knife from rusting, in case of wet weathers. The sheath can be strapped to your belt, bag, or other accessories using paracords. Moreover, as the sheath lies flat and most of it is made out of plastic, you do not have to worry about piercing and damaging the sheath with your knife accidentally. Whether you are a camper or a hunter; a wilderness enthusiast or a hiker, this knife will be the most valuable tool for your outing. The ease with which you can perform a range of activities, coupled with the price that it comes with is definitely worth having this knife in your collection. 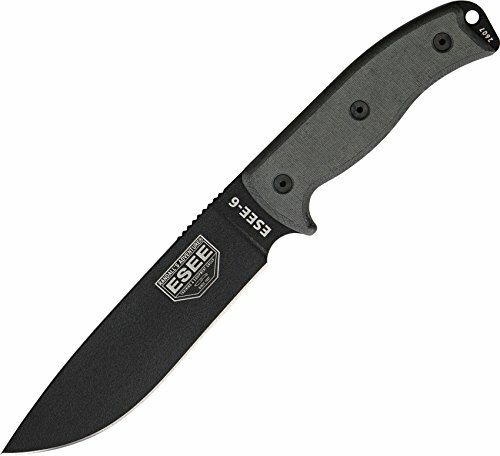 The durable and sturdy handle, the thick blade, and the top-notch sheath, all contribute to the reputation the ESEE 6P has gained over the years.